Performance exhaust systems ensure that a vehicle's engine runs correctly. They also keep toxic exhaust fumes from entering the car. A high-performance exhaust system provides the best possible fuel efficiency and reduces harmful exhaust emissions that pollute the air. Other functions of an exhaust system are to mute the sound of the engine and reduce the exhaust temperature. Because cars can produce harmful gases during the combustion of fuel, it is important to visit a muffler shop right away if you suspect your exhaust system has a problem. 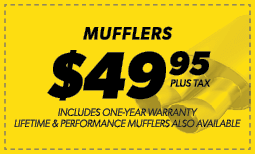 Stop by Meineke #1659 in Clearwater, FL, for a muffler repair cost estimate. A common question we get is: "How often does my performance exhaust system need service?" This mostly depends on the age and mileage of your car. If your car has higher mileage or it's more than 8 years old, there is an increased probability that your exhaust system will need more frequent maintenance or repairs. If you're concerned about your exhaust system or muffler, there is no harm in getting it checked out. Contact our Meineke #1659 muffler and repair shop in Clearwater, FL, and we can answer any questions you have regarding muffler repair cost or perform any necessart maintenance. 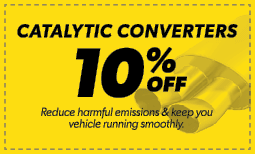 A common question we receive at Meineke #1659 in Clearwater, FL, is whether fuel efficiency is really affected by the exhaust system. The answer is yes. Your exhaust system should include an oxygen sensor. This sensor is designed to detect the amount of oxygen that is coming through the entire exhaust system. It sends a signal to your engine to either increase or decrease the amount of fuel it burns to maintain maximum efficiency. However, if the oxygen sensor is defective, it can cause your vehicle to expend unnecessary fuel. Having your oxygen sensor changed every 60,000 miles can help eliminate this issue before it begins. A high performance exhaust system is vital to keeping your car running smoothly. Problems with your performance exhaust can cause loss of fuel efficiency and also lead to danger from toxic engine fumes. To keep your exhaust and car muffler functioning well, be sure to have your car checked by an experienced performance exhaust systems professional if you notice warning signs such as loud engine noises, steering wheel vibrations or lessened fuel efficiency. Ignoring these warning signs can cause increasingly serious car problems down the road. Contact Meineke #1659 in Clearwater, FL as soon as you notice any of these red flags for car exhaust trouble. The best muffler shop for your vehicle in Clearwater, FL, is Meineke #1659. Our friendly and professional mechanics are custom exhaust experts. They can get your vehicle back in tip-top shape in very little time. We know that muffler repairs can be an unwanted expense, but you can’t afford to drive your vehicle around with a bad exhaust system in place. Along with equipping your vehicle with a performance exhaust that is tailored exactly to your vehicle’s specifications and use, we offer you the most competitive pricing around. Bring your vehicle in today for one of our quality performance exhaust systems for cars and experience the savings.